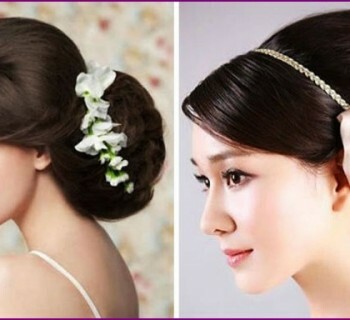 Beautiful hair accessories to make the bridespectacular image of the girl and bright. 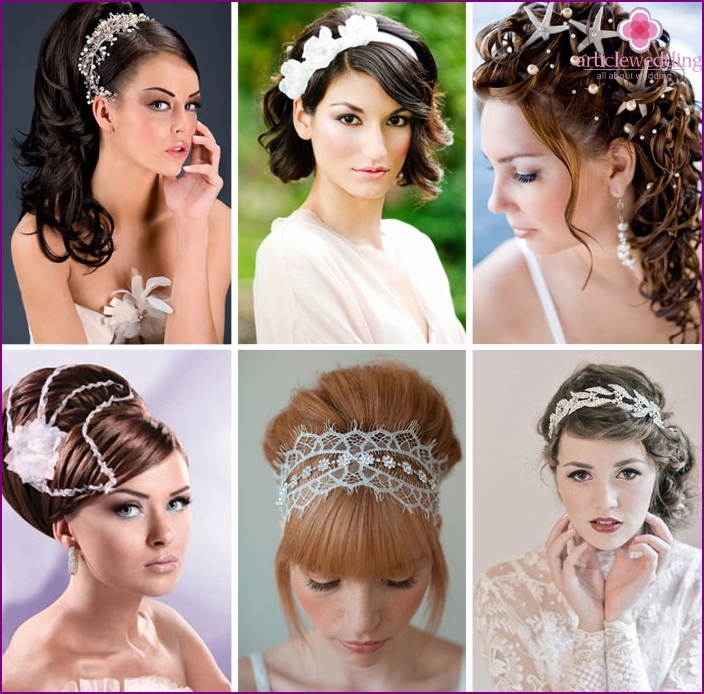 Original bridal hair accessories accentuate a good taste of the bride. Comb, tiara, wrap, bandage should be in harmony with festive laying and wedding dress. It is also an important role in the selection of hair ornaments play theme and style of celebration. What are the hairstyles for wedding accessories the bride? Wedding fashion offers brides a wide selectionhair ornaments. Traditional veils blends nicely with bright combs, tiaras. But the couple often prefer the image of a wedding without a clear snow-white cloth on the hair. 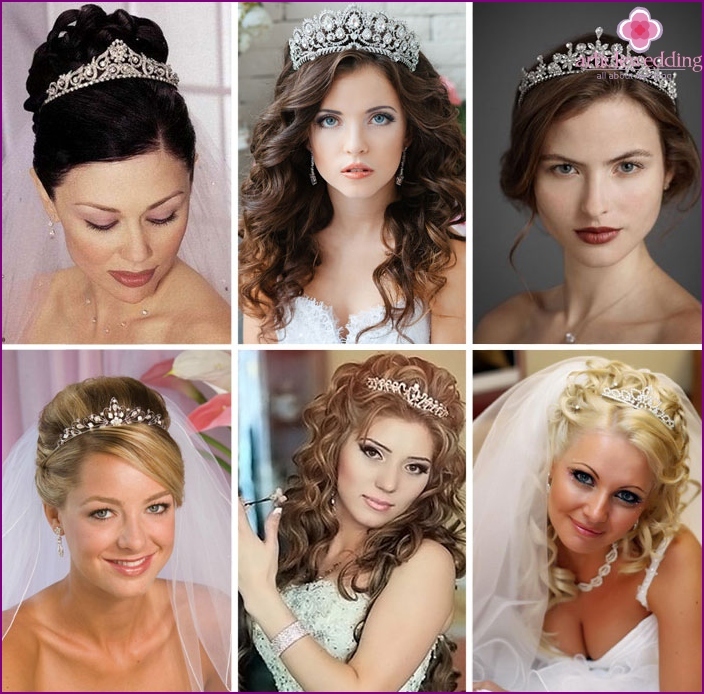 Instead of a veil of the bride are decorated with wedding hairstyle veil, rims, tiaras, flowers, shiny pins. 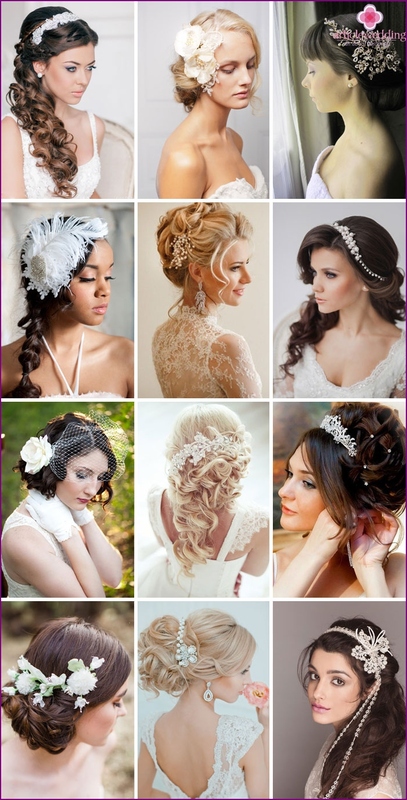 A variety of hair accessories strikes and opens a wide field of activity to create the image of the bride. Some ornaments in their hair and luxuryromantic, others - elegantly restrained and concise. Accessories for hairstyles can be made of precious metals with the use of gemstone jewelry. A product for the hair made of less valuable materials, decorated with beads, sequins, sparkling Swarovski crystals. The accessories can be used satin ribbon, organza, silk and other fabrics. With decorations on the hair bride profitable emphasize your individuality and beauty. Vintage style in the style of 20-ies of the bride cancreated with a bandage on his head, decorated with lace. Unusual, stylish and fashionable decoration on the hair will not go unnoticed by others. Lace elements on the dressing attached to the net or dense base and decorating accessory may pearl patterns. In the original guipure dressing the bride will feel in a special wedding day. 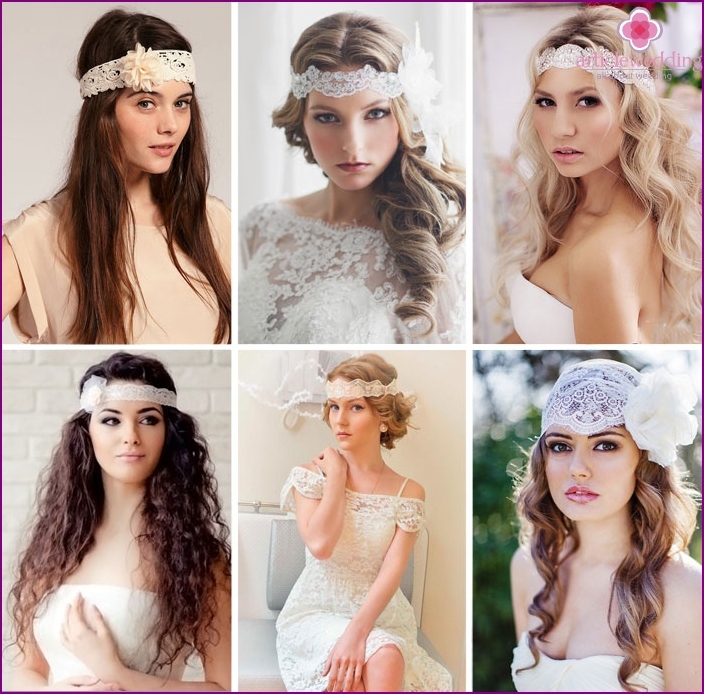 Headbands of flowers - a popular accessory amongbrides. Live plants - gentle, they can not maintain its beautiful views over the busy wedding day, so the hoops with artificial buds are more practical to decorate the girl hairstyle. Delicate petals of white satin or silk will make the bride more feminine and romantic. Hoops with fabric roses go well withloose, slightly curled hair or negligent low beam. For the manufacture of artificial flowers used openwork fabric, satin or cloth similar to the wedding dress material. Wedding hair headbands decorated with sequins, beads. Often the bride and groom choose hoops, decorated with artificial roses, lilies, lilies, daisies, calla lilies, camellias, flowers, orange. Exquisite view of the bride give crestdecorated with bright elements. It can be used for fixing the hair to veil. Comb with shiny stones or pearls is suitable for any packing, but it will look particularly impressive on the hair, which are assembled in a high bun. Harmonically, this accessory will look when it is placed at the top of the hairstyle or the side. crest design can be varied, so when choosing a decoration, the bride will make your image unique and regal luxury. Major tiara or a tiara fit girls with lush, thick strands, and narrow - for brides with fine hair structure. Jewellery bride and the royal crown shouldbe of the same material and with identical stones. Since tiara or diadem is a bright and large accessories, the necklace, chain, earrings for the image of the bride should choose a small size. The crown of the hair is well suited to the addition, in thewhere a moderate amount of bright parts in the form of pastes or stones. Elegant dress without excessive decoration effectively accentuate the beautiful tiara on her hair. For an oval face type will suit different types of crowns or tiar.No better to choose an accessory without big peaks in the center, because such models can visually lengthen the face. For a round face is best to choose the crowns, whosehigh central part. They will help make the image of the bride more harmonious. High tiaras visually make the face longer, closer to the round face oval shape. Diadem without projections would look good on suite with a triangular face. The crown of the V-shaped projection will give the girl to the trapezoidal shape of the face beautiful and harmonious appearance. Tiara worn not on the forehead, and so that part of the hair in front was visible. Modern and bright image of the bride to behair decorated with studs on top of which the pearls or decorative flowers. Such elements for the hair will not only form the styling, but also become a bright accent in the strands of the bride. Miniature accessories, adorned with pearls or flowers help to fix her hair in the right direction and give it a nice shape. For wedding styling type ponytail orFrench beam you can use several decorative studs for decoration. A loose or collected on the curls look great placer of pearl stones miniature fixtures hair. Flowers and pearls on the heels should be in harmony with a touch of the dress, make-up and colors the bride bouquet. Originally, the hoop looks spectacular withunreal colors to the hairstyle of the bride. Artificial flower buds, which are made according to modern technologies, it is difficult to distinguish from live plants. Accessories such elements are not inferior to the beauty of this floral wreaths. Headband with artificial flowers bride can keep the memory of the happy wedding day, as he and many years will have the same form as in the celebration. Spider veins on the hairstyle is perfect for a vintage wedding dress. If the wedding dress features a large number of decoration, then the veil will suit him a modest appearance. Fishnet and pants wedding dress perfectly combined and complement each other. Veil looks good with a short wedding dress. Traditional decoration for the bride hairstyles are notalways suitable for girls who take care of trendy trends. So ladies pay attention to the original hair ornament bridal cap. This extravagant, unusual circular guipure cap is perfect for the bride image in retro-style girl in it will be similar to the aristocrat. Guipure cap, beautifully decorated with beads, crystals, emphasize the individuality of the bride. For modern brides there is a wide range ofornaments for hairstyles. Among the huge number of models of luxury crowns and tiaras with shiny stones, pearl studs, original gipyurnyh hats, bright hairpins with flowers and rhinestones, vintage veils, fine ridges, rims and other jewelry for the hair every girl will find a suitable option for the wedding. Glamorous accessories - an important element in creating a harmonious image of the bride.